Sorry for falling off the blog wagon. I've been busy trying to revamp my portfolio, among other things. I hope to share that with you soon. In the meantime, here's another installment in the apartment tour -- our guest bedroom/office (see the floor plan here). This Pottery Barn pillow (on clearance for $11) was the inspiration for the color scheme in this room. Originally, I had bought it with the intentions of transforming it into a smaller pillow for our living room sofa, but I decided to leave it as is and invest in new linens for my last-year-of-college bedroom (I had gotten overly tired of my very pink freshman dorm decor). 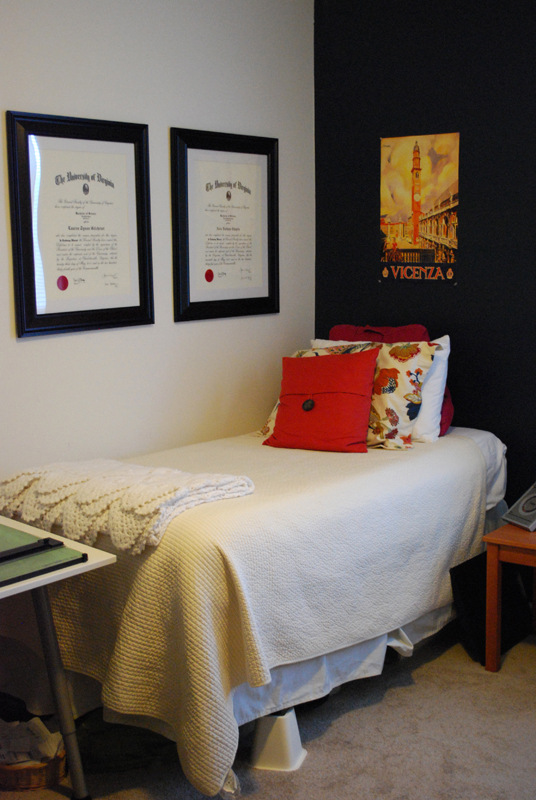 When I moved, I kept my college bed and linens and used them as a base for the design of this room. Because this room used to be Alex's when the apartment was his and his brother's bachelor pad, there were already some marks on the walls that needed to be covered. We decided to paint the wall behind the bed both to cover the damage and to serve as a focal point in the room. I went back and forth on the color but ended up making a fast decision in the paint store to use this dark blue paint (Olympic D55-6 Sailor's Coat). Go bold or go home. With the coordinated, colorful linens, I think it really brings an element of drama to the room. As a side note, the frames on the wall hold our UVA diplomas. We decided that rather than spend $120 on diploma frames, we bought frames from Target for a whopping $35 a piece, matted to 16"x20". You can hardly tell they're not custom. Another factor in the paint color choice was that I knew that I was inheriting my paternal grandmother's mid-century modern chair. The chair was upholstered in light orange fabric so I figured, why not let it pop by pairing it with it's complement? I was a little concerned about using blue and orange since they're so obviously our alma mater's colors (wahoowa!) but the colors are muted enough that they work. With the addition of some colorful accessories, frames, artwork, a recycled paper magazine holder and basket that we already owned, the room looks coherent. At the end of the bed is my Ikea drafting table (one of the few new pieces of furniture we own) with my drafting board from my days in Architecture school. The cabinets and desk adjacent to the drafting table were both pieces from the same set of furniture that we have in our dining room and our master bedroom (my dad built the set from kits in the 1960s). I've been told that the cabinets used to have tapered legs of their own but they've somehow been lost over the years. Since they're legless, I stacked them and used them to store the rest of my art and drafting supplies as well as our computer software, paper, etc. To update the desk, I just changed out the hardware and it functions perfectly as a place to hold smaller office supplies (business cards, notepads, etc.). 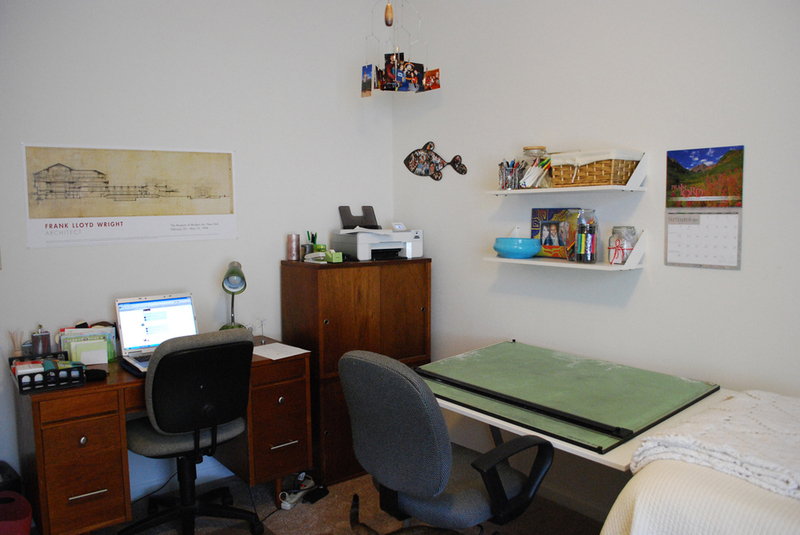 Above the drafting table, I hung some childhood shelves to house vases and canisters filled with colorful art supplies. We also keep our basket of coupons and take-out menus on these shelves (Sorry about the outdated calendar -- it's an older photograph!). The last piece in the room is this bookshelf which belonged to Alex in college. We use it as our "reference library." It holds all of the college textbooks we held on to as well as consolidated binders of instruction manuals, information for the boards we serve on, etc. Overall, the room has a significant focal point and a bright, colorful palette. There are probably a few more pieces of furniture in there than I would like and a few frames missing, but overall it serves its purpose. Now, who wants to come visit?